Almost all MSG is consumed in food applications; major end users include the food processing industry (including producers of convenience foods, snacks, soups, instant noodles, condiments, and seasoning blends), restaurants, and institutional foodservice providers. In addition, MSG is sold directly to consumers. A negligible amount of MSG is used in animal feeds. 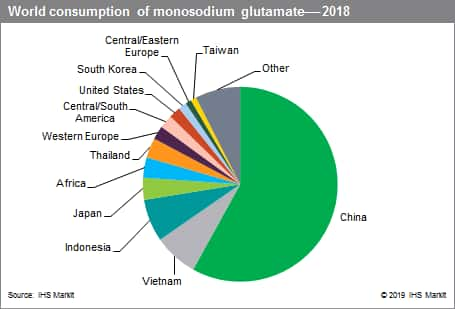 Production of the chelating agent glutamic acid N,N-diacetic acid tetrasodium salt (GLDA) is a new and promising end use for MSG but accounts for a very small share of global consumption. MSG production capacity is largely concentrated in Asia, where feedstocks (such as tapioca from cassava and molasses from sugarcane) and labor are abundant and inexpensive and where demand is highest. 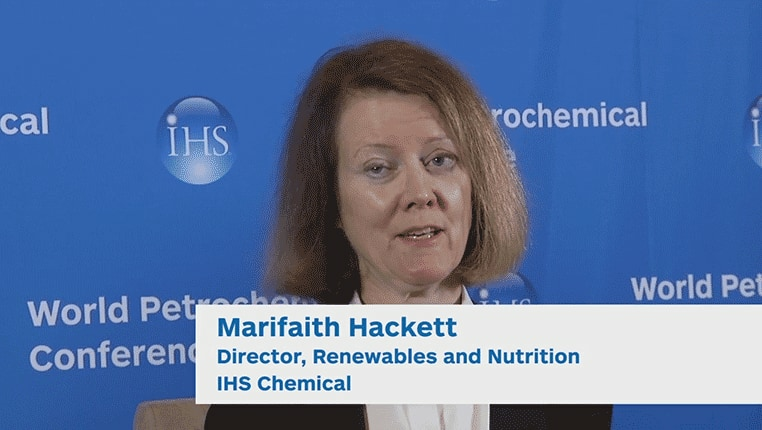 Asian production capacity accounted for approximately 94% of world MSG production capacity in 2018. China, Indonesia, Vietnam, Thailand, and Taiwan are the major producing countries in Asia. China is largely responsible for the recent increases in world production and consumption of MSG. Currently, China is the world’s largest MSG producer and consumer. In 2018, Chinese production and consumption accounted for the majority of both world production and consumption. China is also the world’s largest exporter of MSG. Asia accounted for the vast majority of world MSG consumption in 2018, with China alone accounting for a majority of world consumption. Consumption in the region is forecast to continue increasing moderately, led by demand growth in Indonesia, Vietnam, and Thailand. Improvements in living standards, changes in dietary patterns, ongoing development of the food processing industry, and increased urbanization (which affects the catering and restaurant sectors) will drive MSG consumption growth in these countries. In contrast, consumption is expected to decline in Japan and South Korea during the forecast period. The Middle East and Africa has no MSG producers and relies entirely on imports to satisfy demand. Africa, particularly West Africa, is a major market for MSG; umami seasonings complement the staple diet of potatoes, rice, noodles, and soup. Middle Eastern and African consumption is expected to increase at a moderate rate during the forecast period. Europe was responsible for only a small share of world MSG consumption in 2018. The region is partially self-sufficient, thanks to MSG production at Ajinomoto’s French facility; imports satisfy the remainder of demand. Consumption is expected to decline in Western Europe and remain about the same in Central and Eastern Europe during the forecast period. MSG will continue to cede some market share to yeast extracts (which are rich in naturally occurring glutamates). Consumer preference for foodstuffs that contain few or no additives is expected to restrain consumption growth in the region, especially in Western Europe. Increased demand for MSG as a starting material for the chelating agent GLDA will have a positive effect on consumption growth, but the impact on the overall European market is expected to be modest. North America accounted for a small share of world MSG consumption in 2018. Although the region produces MSG, it is a net importer of the flavor enhancer. Consumption is expected remain about the same during the forecast period. Many foods (notably savory snacks) that include added MSG remain popular with consumers and MSG continues to see widespread use in Chinese, Japanese, Thai, Vietnamese, and Korean restaurants and in the homes of Asian-born residents. Nonetheless, the increased interest in foods that contain no artificial ingredients (such as added MSG) is expected to suppress the growth of MSG consumption in the United States and Canada. In Mexico, taxes on high-calorie packaged foods (“junk food”), widespread concerns about obesity, and the growing interest in healthier eating habits have lowered demand for some MSG-containing foods, slowing MSG consumption growth as a consequence. Central and South America accounted for a minor share of world MSG consumption in 2018. The region is a net exporter of MSG, thanks to production in Brazil and (to a lesser extent) Peru. Brazil led the region in MSG consumption in 2018 and will continue to drive demand growth during the forecast period. Busier lifestyles, increased participation of women in the workforce, and the expansion of the middle class are expected to boost demand for convenience foods, snacks, and seasonings, which in turn will stimulate MSG consumption in the region.